The Quantum Q6 motorized wheelchair Don Toennies used is worth $27,000, according to police, but to him it's priceless. CLEVELAND — The Quantum Q6 motorized wheelchair Don Toennies used is worth $27,000, according to police, but to him it's priceless. “I have trouble walking. My knees and muscles can give out at any time,” he said. A week ago Sunday, an ambulance took him to the hospital. When he got home on Wednesday his wheelchair was gone. He left it on the side of his Cyril Avenue home. “ Panic, panic that if it was gone I would lose my independence,” said Toennies. Toennies said he left his Quantum Q6 motorized wheelchair powering up on the side of his house because he just moved in and there isn’t a ramp yet. Toennies explained he has muscular degeneration and neurological problems which makes it painful to stand and nearly impossible to walk. 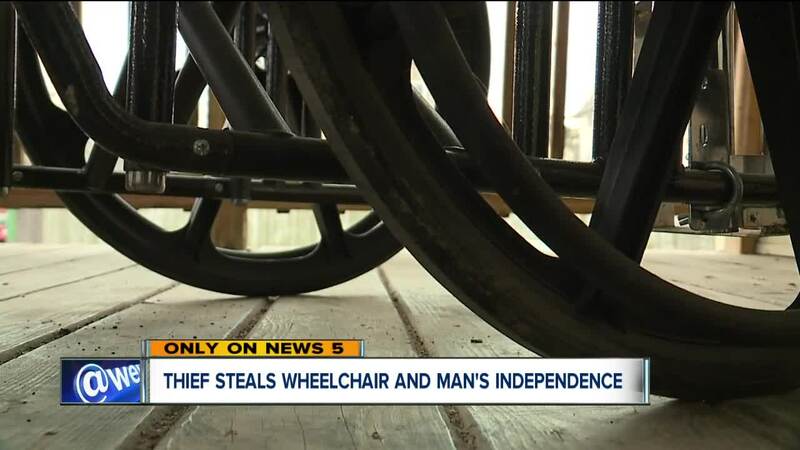 Cleveland police have few leads in the case and CrimeStoppers is offering a reward of up to $2,500 for information about the thief who took the wheelchair. “Somebody knows something. This is a heavy wheelchair. It’s motorized,” said John Minek, Executive Director of Cuyahoga County Crime Stoppers. Toennies dreams of opening a restaurant one day. Right now, his plans to further his education are on hold because his transportation is gone. He has to be reevaluated for another wheelchair, but that won’t happen until the end of next month. He is keeping his positive outlook on life but is understandably upset. Anyone who has information about this crime is asked to call Crime Stoppers of Cuyahoga County at 216-252-7463.